Definitely make sure to check out the BAMFSIES sale at OBS! My decision for Judge’s Choice this year was both a challenging and an easy one. Challenging because of my need to recuse myself from any product or line I was involved with directly (although I’d be remiss not to point out the fantastic job developer Crystal Frasier has done with the Basic Hero’s Handbook for Mutants & Masterminds). Also challenging because of the number of hotly anticipated Kickstarted superhero games that just aren’t out yet, like Champions Now, Trinity Continuum: Æon, Trinity Continuum: Aberrant, and Spectaculars (all sure to make the BAMFsies super-interesting next year). 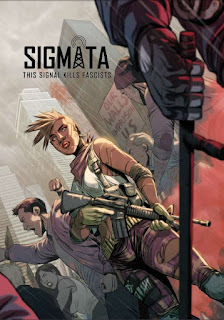 Easy because Chad Walker’s SIGMATA: This Signal Kills Fascists exists. SIGMATA is a break-out roleplaying game in terms of theme, design, production … pretty much all marks. It presents a sweeping vision of an alternate (and yet hauntingly familiar) fascist American Regime and the super-powered Resistance fighting against it. In particular is “the Signal,” a carrier-wave that sparks super-human powers in certain people (called Receivers) giving them the power to fight back against the Regime and to protect other insurgents doing the same. The Signal is fragile and temporary, however, and even Receivers have down-time when they are vulnerable and all-too human. 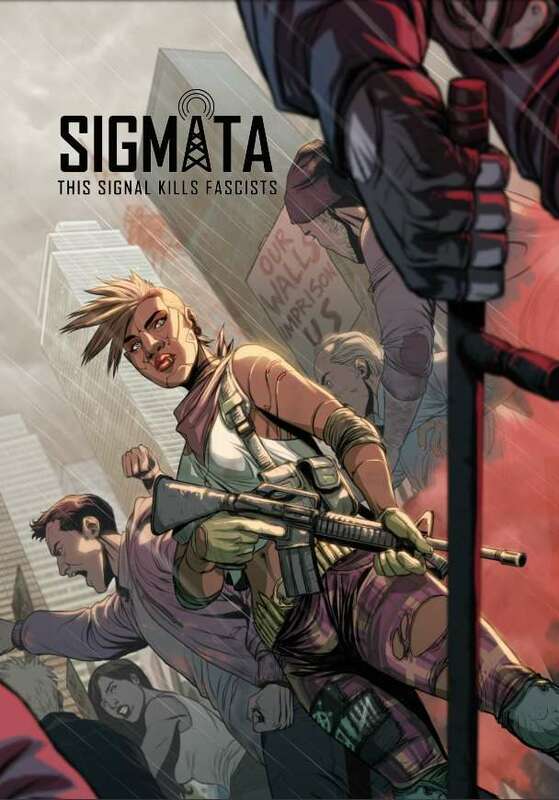 SIGMATA more than earns its various content warnings, as it takes a mature and measured look at the concepts of fascism, authoritarianism, rebellion, and ethical insurgency. My pick for the BAMFsies this year is the Mutants and Masterminds Third Edition Basic Heroes Handbook by Green Ronin Publishing. When producing a roleplaying game in this day and age, one must consider the audience that it is aimed to attract. Large books with tons of complicated rules are nice for the experienced gamer who has had years to absorb said rules. But as the scope of tabletop RPGs is changing to include casual and novice players -- indeed a more family-friendly audience -- a company must be willing to produce a book that is able to be read and understood by a novice. Those who are totally unfamiliar with an RPG game might not want to read hundreds of pages of a book just to play. They will instead turn to a board game or (worse yet) a video game to find their entertainment. 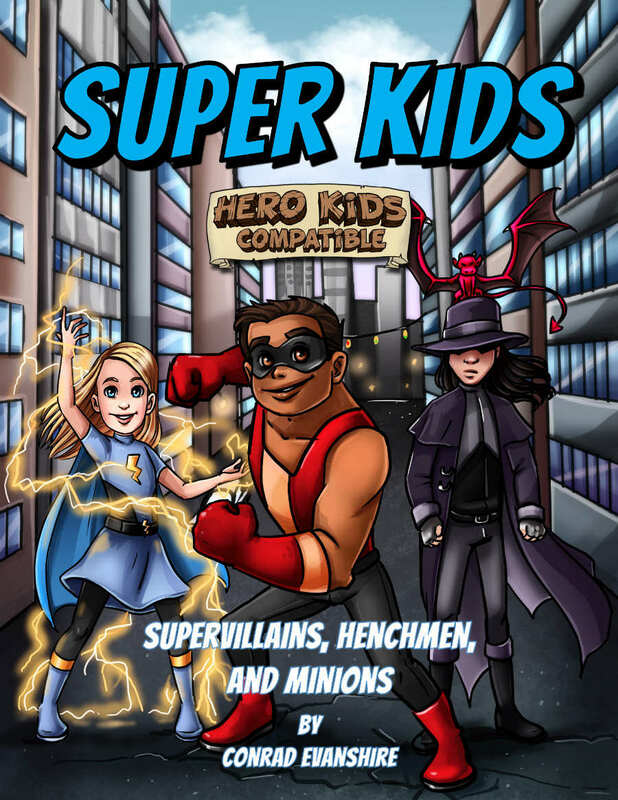 This is where I have to applaud Green Ronin Publishing for their production of the M&M Basic Heroes Handbook. 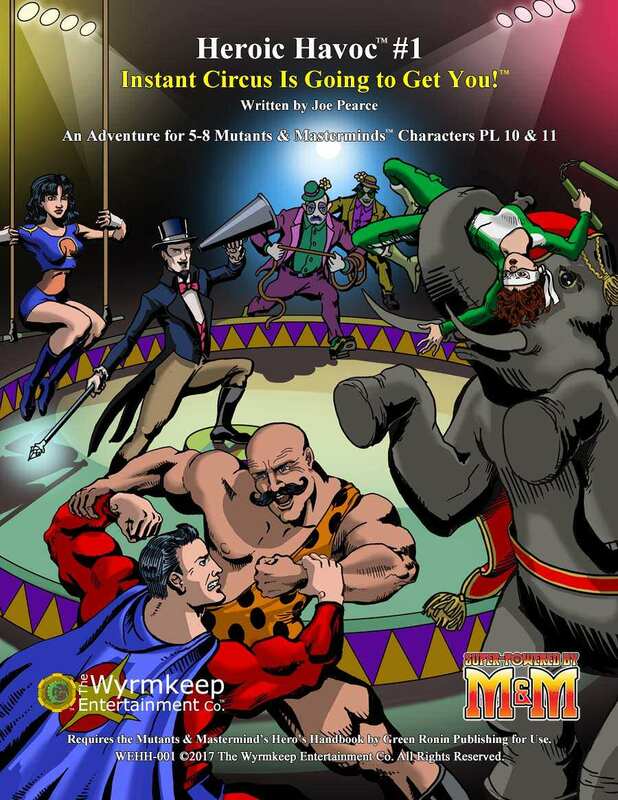 It is all the same rules as one will find in the standard M&M Heroes Handbook, but it is simply rephrased and formatted in such a way that a brand new player to a roleplaying game can pick up the book and read it to learn and play. My congratulations to Crystal Frasier and Steve Kenson for this new addition to the Mutants and Masterminds RPG legacy. I look forward to meeting all the new M&M players this book will bring to the tables. 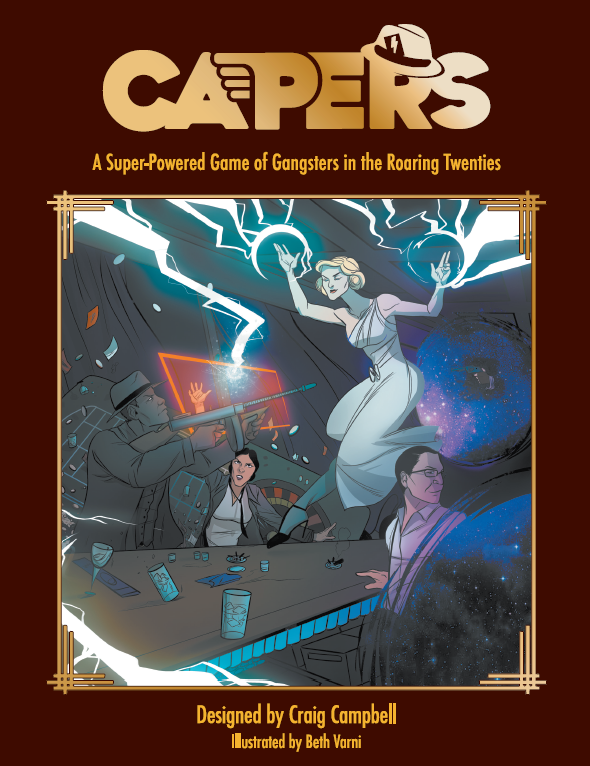 Best for me was Capers, from Nerdburger Games. It was a mashup that I didn't expect to like (I'm rather fussy about the mashups I like) but the powers system and the resolution mechanics work very nicely for me. It's complete and evocative, and has very little fat on it. 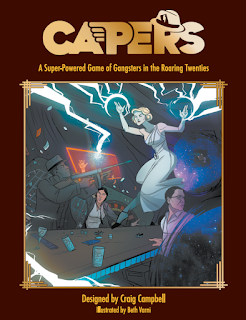 If I had to take just one thing from 2018, it would be Capers. 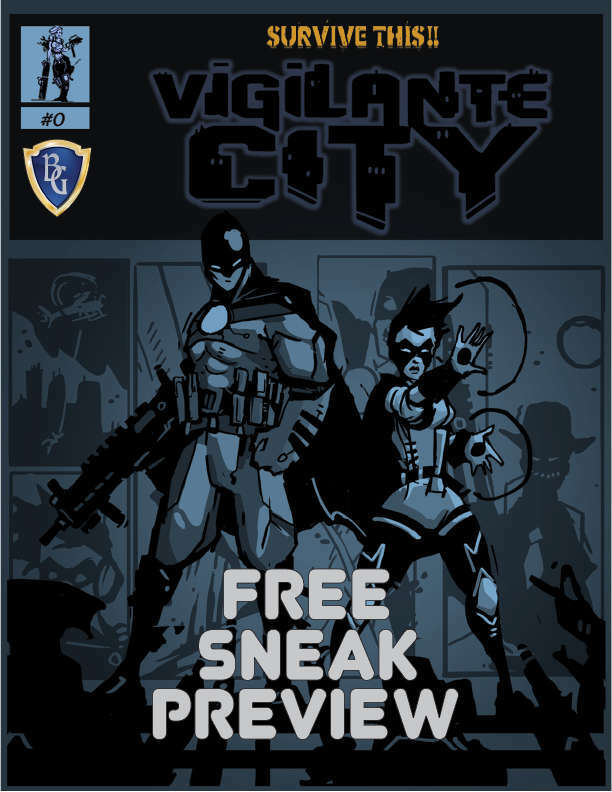 Survive this: Vigilante City by Bloat Games is a dynamic reskinning of the OSR rules. The game was kickstarted successfully and a preview document was kicked out so that non-backers could take a look. One part Batman the Animated series, one part TMNT, this game brings the love of 90’s animation to the game table. With added rules like the Survival Stat and amazing art, this game is the superhero romp you didn’t know you needed! Every year the BAMFSIES recognize the top in superhero RPGs. As a part of this, every year we have a "Gamer's Choice Poll" - which is basically an open ballot for everyone to vote on their favorite release of the last year. We're accepting nominations for the Gamer's Choice ballot now. Please feel free to enter your suggestions in the comments below. First off, thanks to everyone who voted. We have over 1500 votes this year - the most over. We are sincerely grateful to everyone who took the time to look over this years candidates and vote. ALSO - OneBookShelf is doing a BAMFSIES Sale where many superhero genre titles (including most of our award winners) are 25% off. Finally - for coverage of superhero RPGs, comics or general low audio quality mayhem - please check out the BAMF Podcast - who proudly sponsor the BAMFSIES. 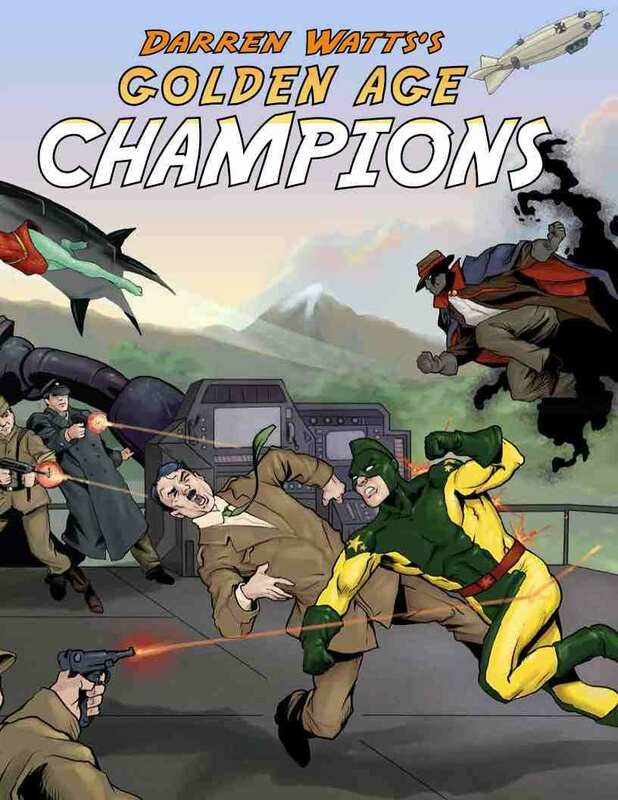 Darren Watts' Golden Age Champions from High Rock Press was the number one choice. Close behind, second and third places, respectively, go to V&V 3.0 Mighty Protectors From Monkey House Games and Sentinel Comics: The Roleplaying Game Starter Kit From Greater Than Games. This is the section where we invite RPG Industry luminaries to spotlight particular products they felt were deserving of attention in 2017. You can find out more about our judges for this year on this page. 2017 was once again a great year to be a superhero gamer, and it was hard to choose just one product, but ultimately, The Mighty Protectors won out for me. 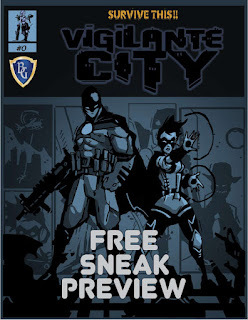 You see, the classic Villains & Vigilantes was the first superhero RPG I ever bought and played back in the 1980s, and The Mighty Protectors is the latest incarnation of that system, by its creators, Jeff Dee and Jack Herman, featuring Dee’s art, both classic and modern. The book is a slim (by modern standards) 152-page hardcover, combining the look and feel of the original editions of V&V with some updated ideas and mechanics. It’s still loaded with random generation tables and the notion of playing yourself with super-powers, but my personal favorite part of the book is the “The Mighty Protectors Multiverse” chapter, an encyclopedic breakdown of setting elements from the authors’ own long-running campaign, things like the government super-agency CHESS to the Frankenstein Galaxy and the multiversal Heralds of Fate or historic events like the Core War or the Endgame Initiative. It’s worth the price of admission to the book all by itself. 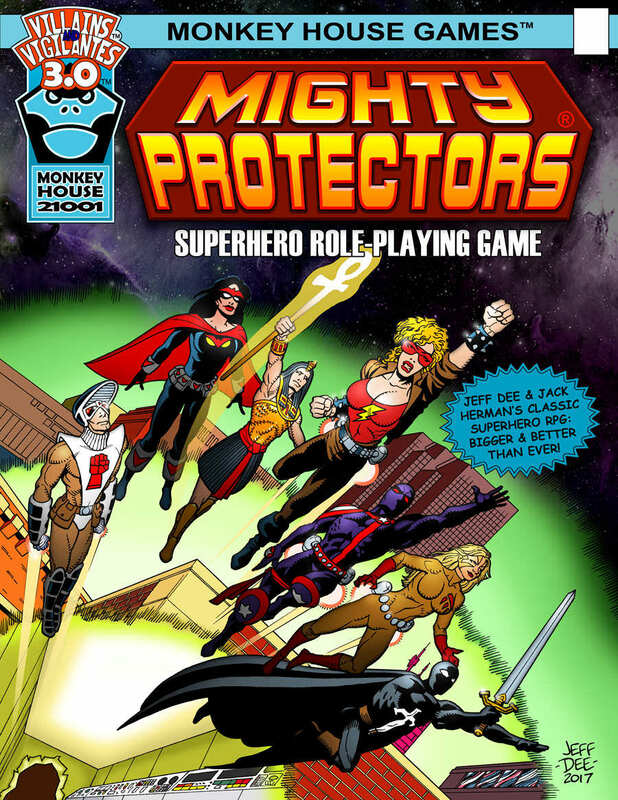 So if you’re a fan of “Old School” style superheroing or just looking for inspiration or a wealth of ideas to mine for your own setting, the Mighty Protectors RPG is worth checking out. I originally picked Save the Day because I liked the way the system did a "Race and Class" style approach to character creation, but did so in a way that fit the genre conventions of superheroes, instead calling them Origin and Class. A character is built by combining two halves of a sheet, making many combos possible and generating a hero very quickly. Powers and abilities can come from your origin as well as your class. So two characters with the same power set might be very different from one another. The cartoony art design was also a nice touch. In the Advanced Rules, David has taken the tools provided by the Basic Rules, and deconstructed them, allowing players to randomly roll characters and customize their Origins and Classes. 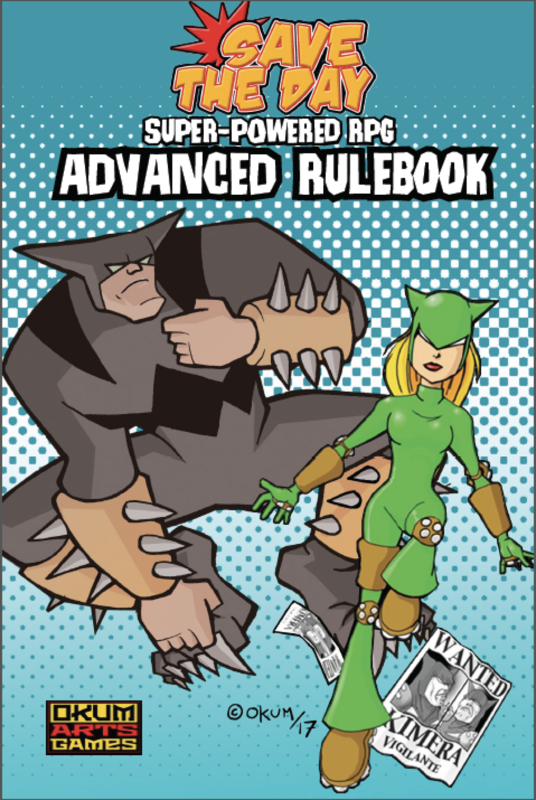 The Advanced Rules also introduce some new powers, like Time Travel, new Tweaks to adjust powers, and new "disadvantages" which the system calls "Dark Secrets". That's another thing to like about this system; it adheres to genre conventions even in naming various rule mechanics. It also tells more about vehicles, equipment, and new optional rules such as "Mind's Eye" style roleplaying that eschews maps and minis (though the printable maps and minis were one of the things that first attracted me to Save the Day). Crystal Frazier's Pick: "Heroic Havoc #1: Instant Circus Is Going to GetYou!" It's a classic, silver-age-minded adventure built around the classic "evil circus" trope that was everywhere in comics back in the age when they had an official cap on the number of gorillas you could use every month." Also, you get to fight an elephant! That's classic superhero action. 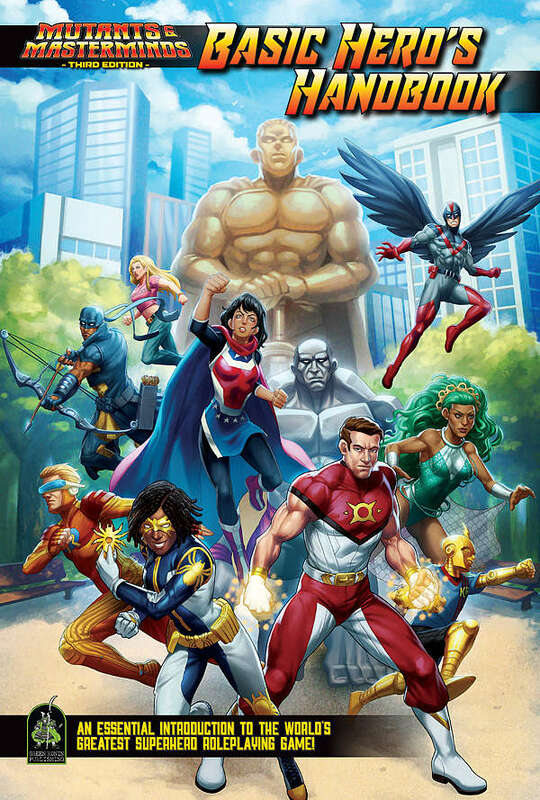 No one brings the combination of loving enthusiasm and faithful research and rendition to an idea like Darren Watts, making his Golden Age Champions sourcebook an invaluable resource for anyone who has an interest in the early days of superhero comics. Gamers and comics fans alike will find tons to love, whether they're Hero System fans or not. 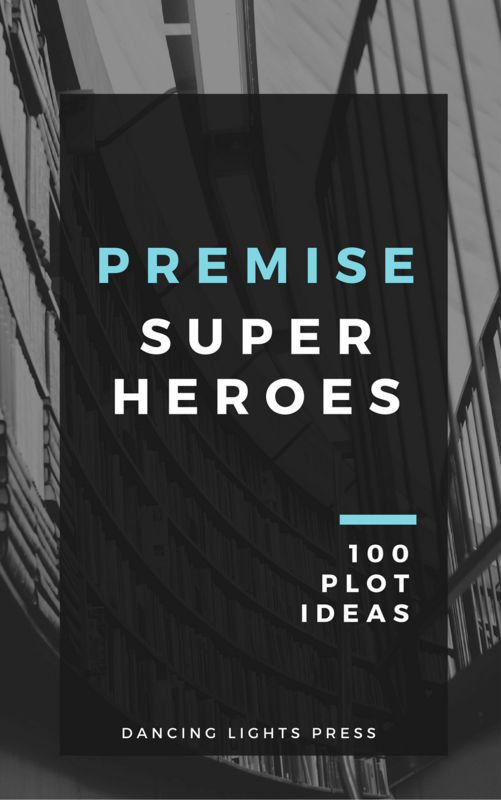 The Premise line of products are designed to help GMs (and anyone telling stories) come up with good ideas to run with, providing lots of excellent guidelines and details to set the imagination running. With all that goes into telling involved and compelling stories in a fully-fleshed superhero campaign, this is a must-have for supers GMs. 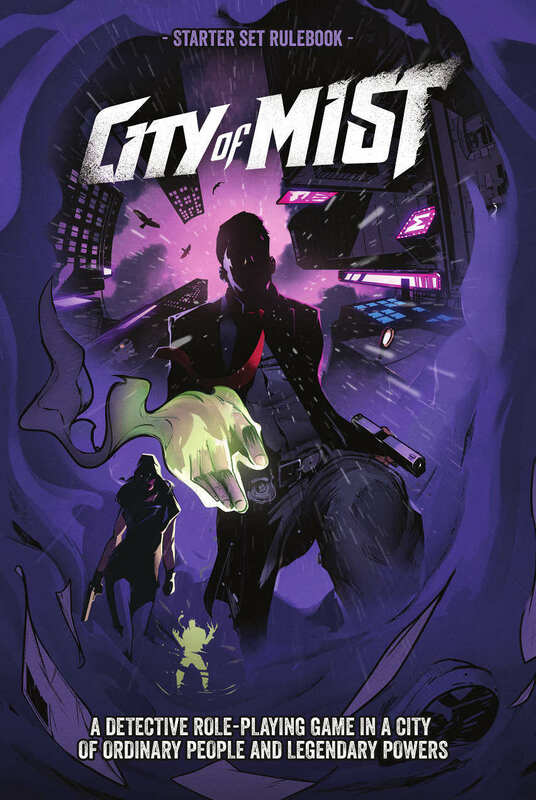 It's hard to find a compelling new idea in the world of gaming (or entertainment, really), but City of Mist pulls it off. Superheroic folks trying to figure out their lives in a strange city where myths and legends overlay a noir-flavored, gritty urban realm. 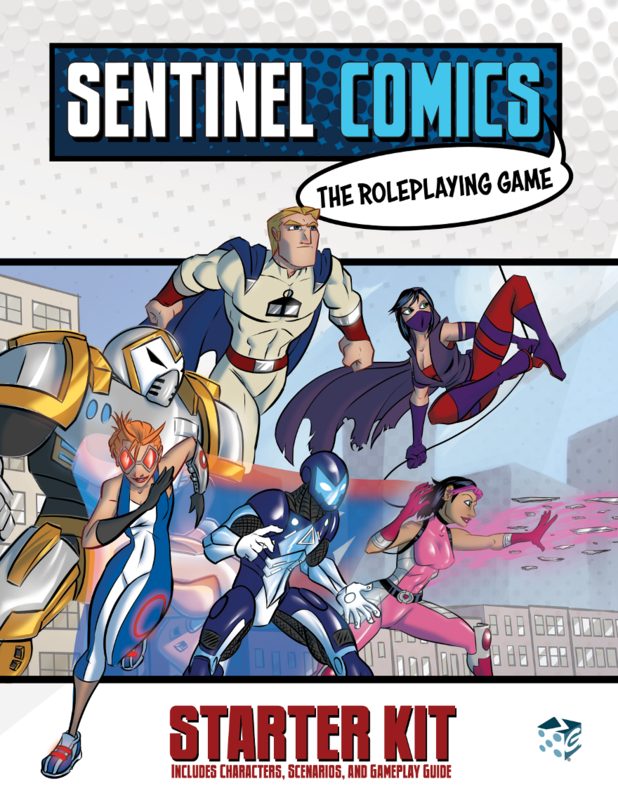 Based on the insanely popular cooperative card game, Sentinels of the Multiverse, this is one that's been long-awaited by fans dying to know more about the world and stories promised in the flavor text of those cards. It's a very interesting game design, and this "starter kit" is a good idea all the way around. Traditional superhero RPG fans may or may not take to the rather different approach the designers took here, so having a way to get the sense of it without going "all-in" is the right move. Fans of SotM will recognize not only all of the characters, but how the RPG mechanics directly reflect the way those characters play in the card game. Arguably the most successful kid-friendly, family-oriented RPG in the world gets a superpowered upgrade with this one, and it doesn't disappoint. All those superhero movies are gonna have the youngsters wanting to power up, so here you go. In an effort to cast as wide a net as possible, we're asking for self-nominations of superhero RPG products this year for the BAMFSIES Gamer's Choice poll. SO - if you have a favorite superhero RPG product that was released in the last year - or if you're the publisher of one, please reply to this post with the name of your product and the name of its publisher and we will make sure it is included in this year's poll. Any superhero RPG product released in the last 12 months or so is eligible. Note - if your product was submitted for the 2016 Bamfises, it's not eligible for the 2017. Sponsored by the BAMF podcast - the BAMFSIES are a cheeky and fun RPG awards focused solely on superhero RPGs. We’re not nearly as serious as the Ennies. We’re probably more serious than the Grammys. There's a renaissance going on with supers RPGs right now - and it's not really reflected in mainstream RPG awards as those tend to be focused elsewhere.